This week’s giveaway winner is Sabrina Fish! Whether your inhabitants eat actual food or just absorb nutrients through their feet (or something), they will need to consume nutrients in some way to survive. 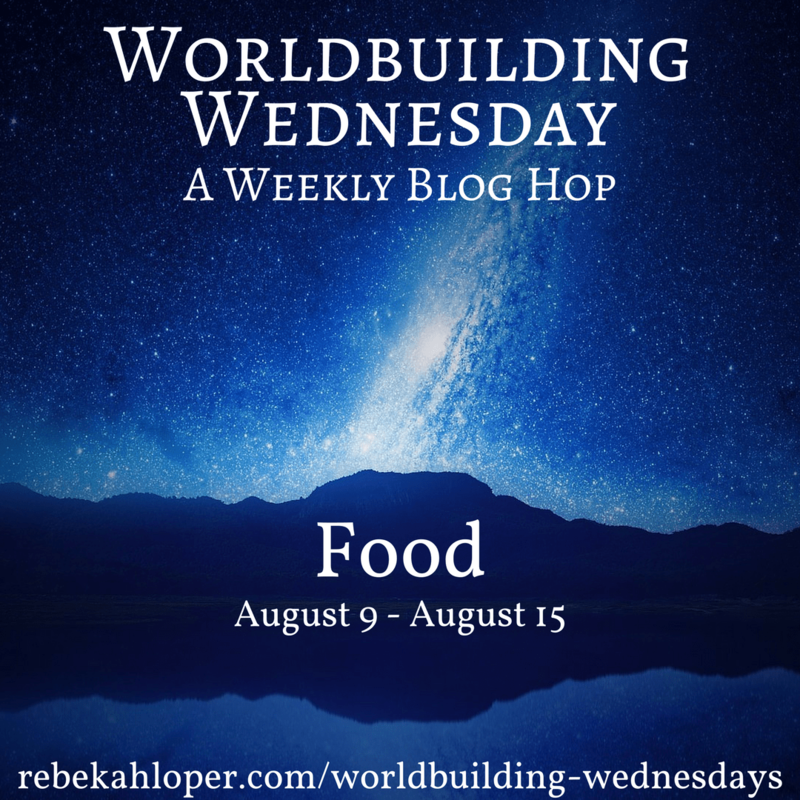 There are so many aspects to worldbuilding food, and how to include it in your fictional cultures, whether fantasy or sci-fi. It’s not possible to even scratch the surface in a blog post, so here are a few highlights. A staple of someone’s everyday diet is going to be what is abundant in a region, and what can be easily grown (plant products) or produced (animal products) there. This will also likely become a major export item (thinking back to last week’s economy theme). Locations with fertile soil and an adequate (and abundant) water supply will be well-known for their agriculture and their livestock. However, that doesn’t mean places with a harsher climate are completely cut out of those types of production – it will simply be more specialized and harder to maintain. Harsher environments will have the advantage of unique products, though. Pistachios, for example, require drought-like conditions for growth and production. There are many animals that also thrive in deserts. Unique products will be seen as more exotic, and can be a valuable source of income to a culture. What may be a staple in one place will always be a rarity in another. There are some nutrients that must be acquired and consumed, no matter what. These will be things like water and salt. If a region doesn’t have any of these things naturally present, there are two options: that region will not be settled (most likely, especially in a pre-technological civilization), or it will have to be imported in from elsewhere. That said, if there are plants growing, there are almost always be basic nutrients present, even in trace amounts. This isn’t really helpful when it’s impossible to consume enough of something to get the adequate amounts needed for survival, but this is why varied diets are important. Any time you see a society relying on one single source of food for their dietary and nutritional needs, there will be health issues and deficiencies, unless that one food source has been perfected to provide all necessary nutrients. And then it’s going to get really boring, really fast! How do your inhabitants cook? How they develop different types of foods will depend largely on this. To boil water, they must have a way to contain water in a heat-proof and fireproof vessel. To bake certain things, there must be a way to subject the item to indirect heat from all directions (whether that means an electric oven, a brick/earthen oven, or a cast iron pot with coals under it and covering the lid. (Just to name a few options.) If a society doesn’t have the ability to create pots and pans, cooking will be much more primitive – food wrapped in leaves and buried in coals, or cooked on a spit over an open fire, etc. If a society does not have electrical power (or an equivalent) all preparation will be done by hand. Kneading bread dough will be something that takes several minutes. In a society without electricity (or an equivalent, whether magical or scientific) cooking is not going to be something that can wait until the last-minute. There will not be an pre-prepared or boxed foods. If a fire has to be lit, you can add even more time to the cooking process, because it takes time to go from open flames to coals. There will also be creative solutions for when food can’t be cooked, and for when there is an abundance of it that must be preserved. Food may be dehydrated (either by air or by slowly cooking with low heat – jerky, pemmican, hard tack), fermented and/or cured (yogurt, pickled vegetables, bacon, salami, cheese, smoked meats, etc), frozen, canned, etc. It all depends on the tools they have available. What is your main character’s favorite food? Is it a staple of their culture, or something exotic they rarely have access to? Food is such an important aspect of worldbuilding. There are a lot of things I didn’t think about for my worldbuilding on my space-station story Tiberius Base. It didn’t even occur to me they would probably be growing rice for all the Asians in the story! Perhaps because I can’t eat rice myself because of all the carbs. It really is! Urban farming and raising chickens has brought my attention to so many things about food that I wasn’t aware of before, even though I knew more than many other people are taught these days. And it is always our blind spots that come back to bite us, isn’t it? XD It sounds like they would definitely be growing rice at Tiberius Base!